Apologies for being a little slow with this post: a massive migraine over the weekend meant that I made precisely zero progress. Anyway, I was a little bit worried about this episode when I was re-watching it: after last episode's costume explosion, there are relatively few big changes in this one. There's loads of backstory and several scenes set in Castle Black, a location which is not exactly a costume goldmine. This episode also contains the first of the really flagrant "sexposition" scenes, which is, for obvious reasons, a bit light on the clothing front. Thank the old gods and the new, then, for the second half! 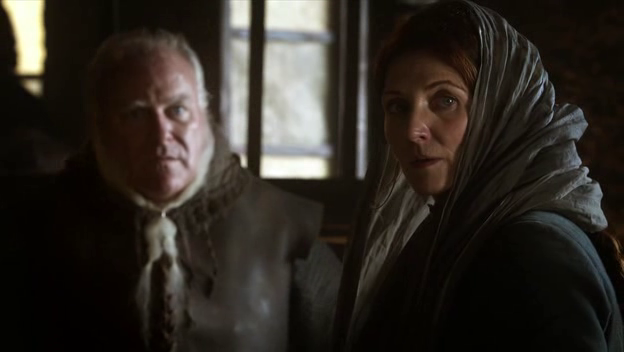 The tourney of the hand yields some interesting pieces for discussion, as does another scene with Cersei. Let's get stuck in. 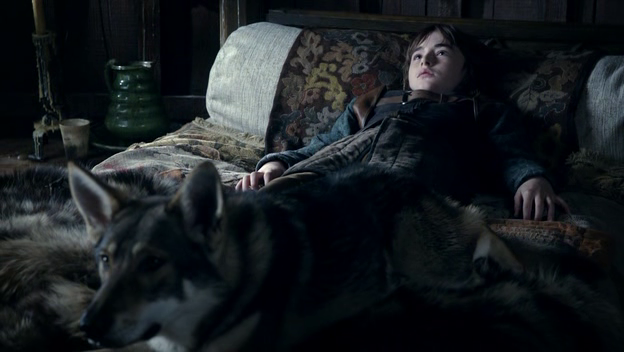 We start with Bran, in what is clearly a dream sequence. He's dressed the same as he was in the very first episode, with the buckled sleeves. But then, a little surprisingly, we find out that he's wearing the same kind of sleeve in "real life, though rendered in a more decorative fabric. 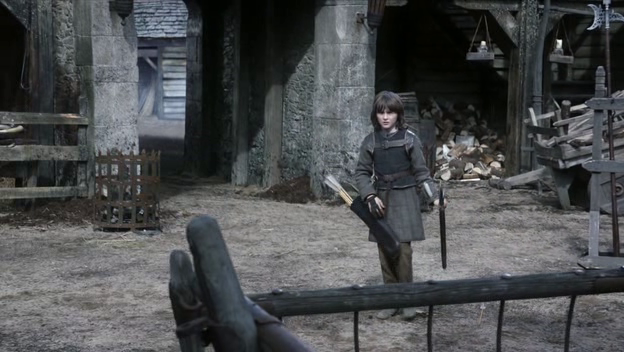 I'd assumed in the first episode that these were some sort of archery guard, but they seem to be a Bran trademark. I think the arm detail is interesting in light of his paralysis. I also think the image of him laying back against foliage and a textured, white pillow is...worth drawing cursory attention to. Let's just keep it in mind. It may pay off down the road. I feel like it's also worth checking in on Old Nan. 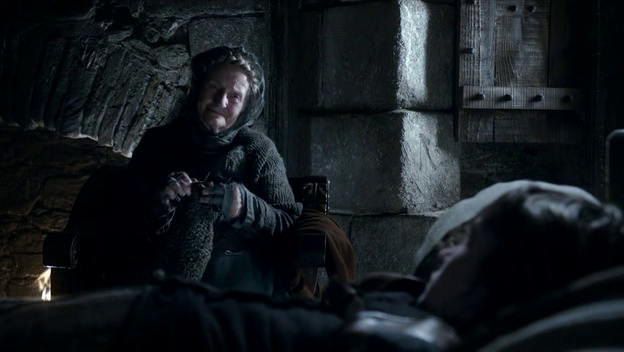 I've mentioned in a couple posts that characters sometimes blend in with their surroundings to show belonging: Nan could not look any more like a "part" of Winterfell, with her head-to-toe grey and her square face. To be honest, I should have brought Nan up last time when she told Bran about the White Walkers; here, Theon may call her an "old bat" but she's seems part of Winterfell here. 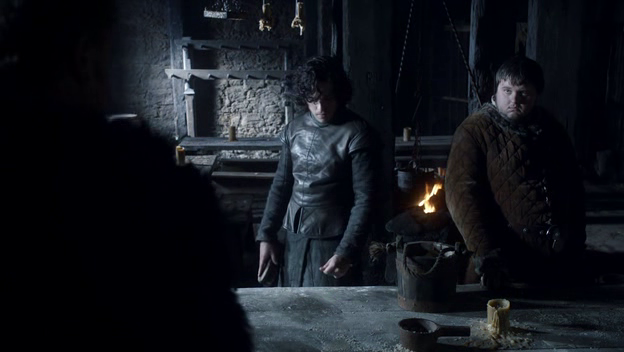 I wasn't sure if I should talk about Theon in this scene or not. He's wearing the same thing he always wears, but we get a little reminder that he's NOT a Stark (Summer growls at him when he enters the room). I'll discuss Theon a little more later. 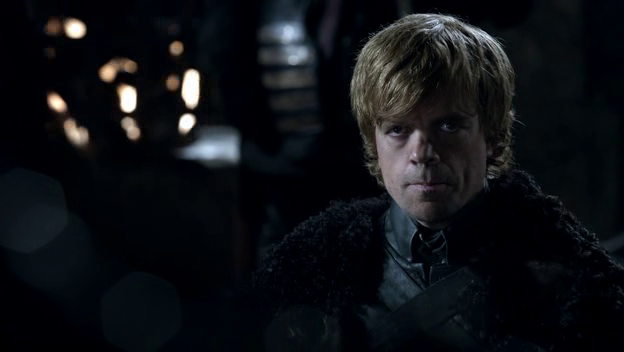 And Tyrion is pointedly left out, despite being all in black and looking rather "Night's Watch" himself. 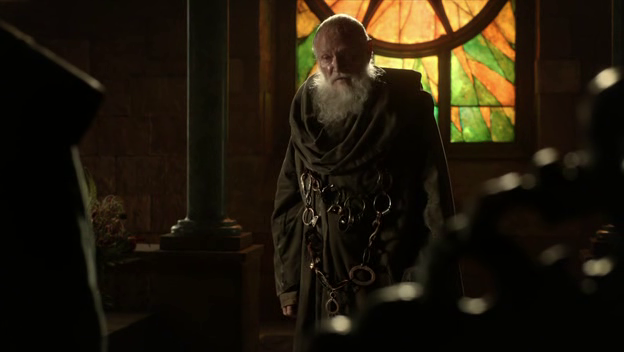 This is the same black we saw him wear last episode, after Benjen schooled him on the Watch's importance. 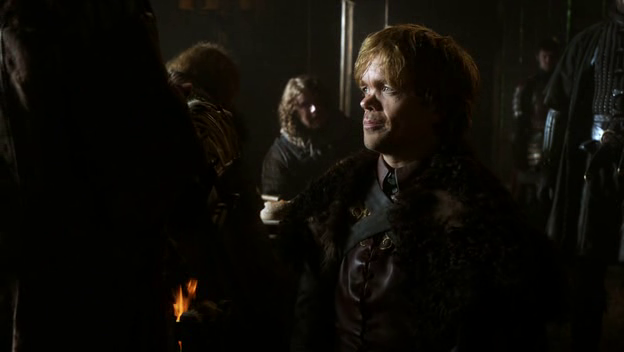 Tyrion clearly started to identify with the Watch while he was there, and being excluded seems to sting: he goes on to refuse the hospitality of Winterfell, even after Robb offers it. 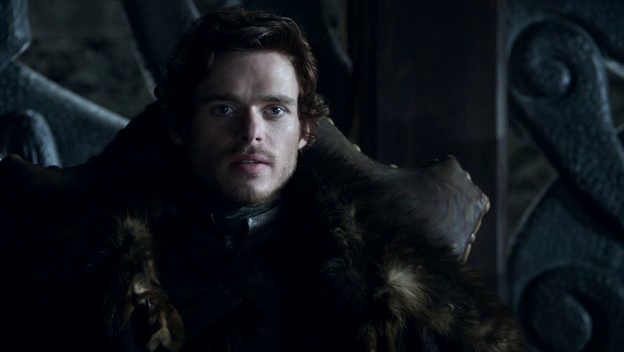 Here's Robb dressed in his best "Lord of Winterfell" drag. He looks the part--his wolf-fur ruff seems to have gotten a bit bigger, and he's looking appropriately dark and sombre. It doesn't really seem to fool Tyrion, though, who in this scene with Theon works out that Cat is not in Winterfell at all. 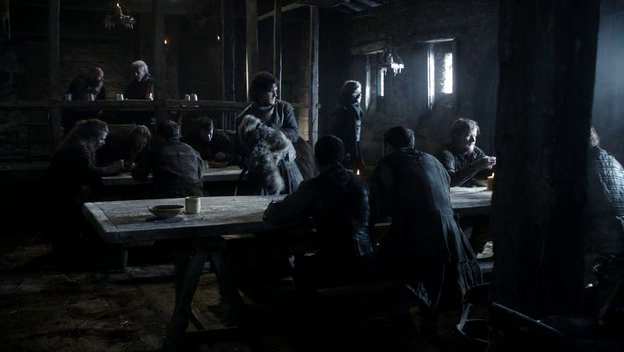 More importantly, this is where we finally find out who Theon "is": we know he's included in secret Godswood meetings, but he stands with Jon when the royal party arrives, and he doesn't get a direwolf. Here Tyrion refers to him as a "your enemy's squire" and helpfully fills us in on some Greyjoy history and how Theon came to Winterfell. 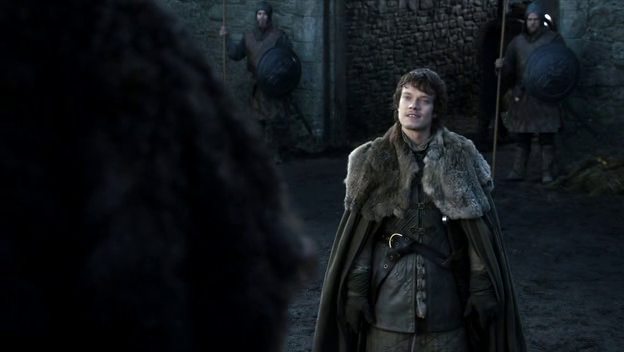 Theon has utterly blended in with the Winterfell milieu up till this point (from the very first time he just sort of...appears in a scene in Episode 1). Tyrion mocks him for his "loyalty to [his] captors", but he really seems to be, in many ways, part of them...though excluded in key ways. Theon's major dilemma is set up here: on one hand, he expresses pride in his Iron Island heritage ("must have been a pretty sight" is his comment on the burning of the fleet in Lannisport) but is, essentially, a Northerner now (in costume and in manner, "The lady's whereabouts..."). 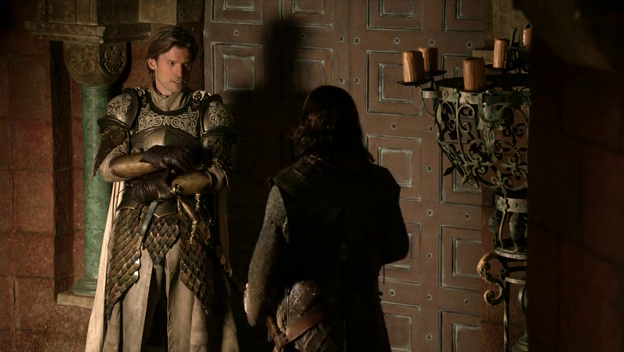 We also get a pretty good look at Lannister armor in this scene. Lannister helmets initially read as "Roman" to me (the ridge along the top as a stylized version of the Centurion red fringe) but they're increasingly looking Japanese-inspired to me (take a look here to see what I mean). I guess this smooshing of Roman with samurai, two famous fighting forces, could simply be a shorthand way of letting us know that Lannister soldiers are a class above, say, the Winterfell guys we see behind Theon. Off to spend some time at the wall, and say hello to Sam for the first time. 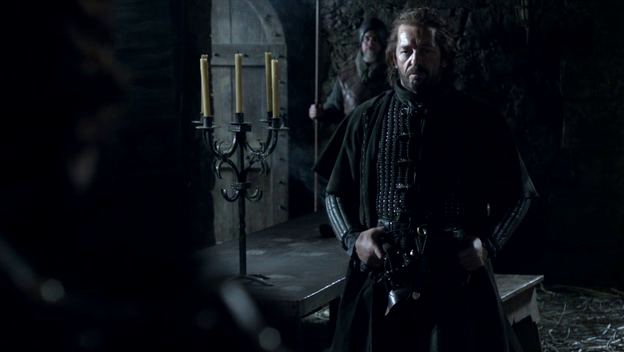 The Castle Black scenes are a bit of a snore from the costume-perspective. Sam shows up in something that's almost a color: brown versus all the dingy grey and black on the other side. He doesn't look poor, exactly: his clothes are far from ratty, and there's some decorated fur going on around the neckline (I zoomed way way in, but it doesn't look like any particular design). Sam's literal neck-beard always makes me laugh. Can you see why I was worried about this episode's write-up? This is another scene of characters wearing exactly the same things they were before. 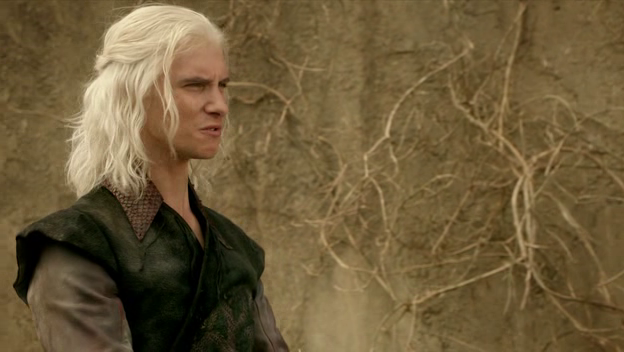 Viserys is, as always, wearing his Targaryen sigil outfit. He looks like a pouty elf. We get to see that he's got a dragon-head decoration on his sword too; he's not exactly subtle. Dany meanwhile is all about her new Dothraki life, and it shows. 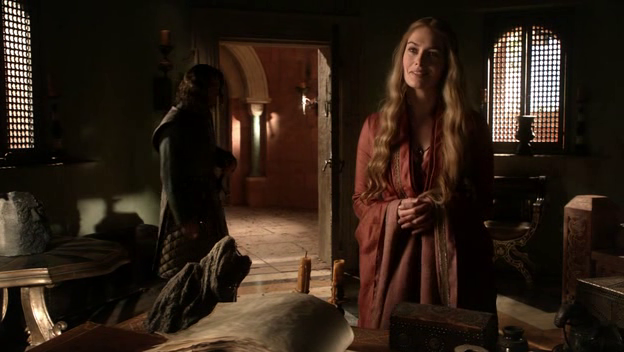 She and Viserys have a conversation that hinges on the two possible meanings of the expression: "my people". For Dany, it means belonging, and for Viserys is means ownership. This difference is clearly reflected in how they're dressed. I figured we should probably start paying attention to Dany's braids too, since we learned in the previous episode that Irri braids her hair while teaching her Dothraki. I feel kind of stupid for not discussing that part of the scene in the Episode 3 post, since it's kind of a great little dual image of inwardly and outwardly "becoming" a Khaleesi. Dany's braids are a bit chunkier than anything we've seen on women in Westeros, though her half-down hair still strikes me as kind of Westerosi. The braided straps of her shirt also mimic the braids in her hair: her whole costume is very tied together and harmonious. We finally find out Jorah's deal in this scene. This whole episode is a backstory-stravaganza. Jorah's always looked quite northern, but he outright says that Ned Stark "wants [his] head" at this point, and the link is made clear. Ugh, this scene. It lasts forever and has no costumes. I'm throwing it in here to show a) why the first half of the episode is so light on analysis (there's not much to analyze here) and b) so I can complain about the Doreah casting. It always bugged me: she looks too...modern, like a budget Megan Fox or something. Takes me right out of the scene and out of the story. I know I'm probably the only person who found that irritating. I'll get off my soapbox. It's time to check in with Sansa, a.k.a. No-one's Favorite, back in King's Landing (I jest: I'm a giant Sansa-apologist, and have hopes she'll turn out awesome by the end of the story). We get some more history--a much less grand version of the history of the Iron Throne, simply forged by Aegon the Conqueror, rather than melted together by a dragon. 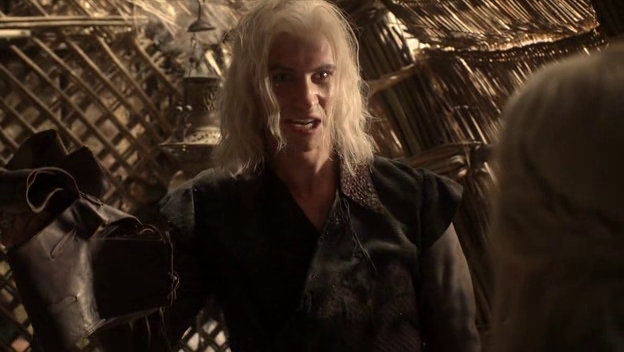 Either Westeros is forgetting what part the dragons played, or Viserys is hyping up his family's power. Sansa is wearing the same thing she was back on the Kingsroad, during the confrontation that ultimately would end in her direwolf's death. This scene sees her discussing the fallout: the fact that Joffrey "hates" her and her refusal to forgive her father. The dress is a direct callback to the events of the episode. Sansa is also continuing to go Southern: the embroidered shawl is new, and floral designs are quite southern, though everything else is pretty solidly northern, and her hair is still a bit fly-away and not the slicked-down glassiness we'll see later. Poor Ned's stuck in a sweltering Small Council meeting, and we see yet another military uniform, this time of the City Watch. 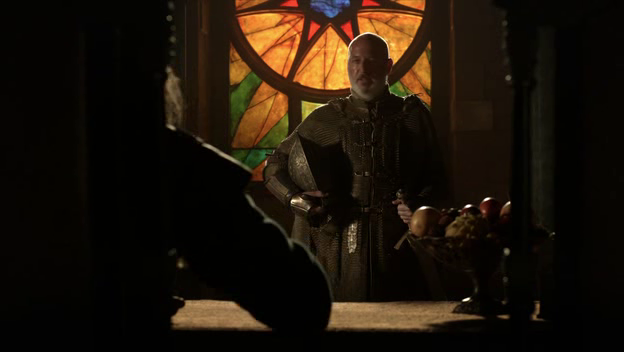 Janos Slynt here doesn't stand out particularly: it's pretty simple chainmail. Next to all the other fighting forces we've seen, the City Watch doesn't seem like much. 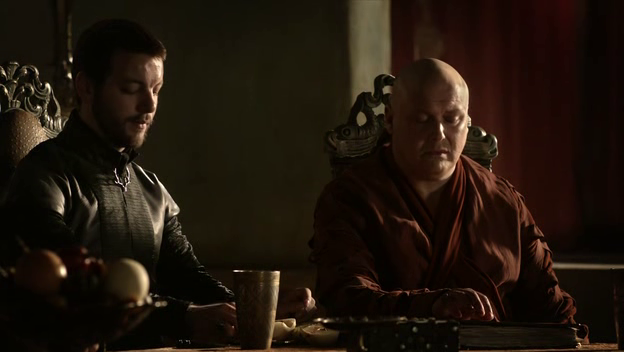 Renly and Pycelle look the same as before, but Varys has gotten a total costume change for this scene. He's gone from his green botanical print last time, to a solid red here. I don't know if it "means" anything exactly, but it's interesting that he'd get a whole new costume in a relatively short space of time. Conleth Hill is wonderful as Varys. 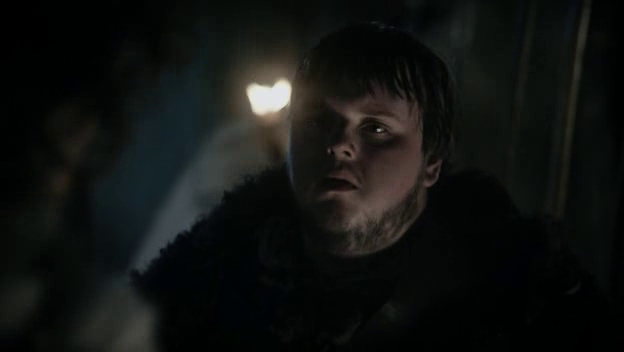 The way his face just falls when Ned say's he'll give 20 of his own men to supplement the City Watch is amazing. He can barely believe what he's hearing: clearly Ned is making at best a risky move and at worse a huge miscalculation. Here's the face-crack gif'd in all it's majesty. Sorry it's such "Baby's First Gif" quality, I didn't really know what I was doing. 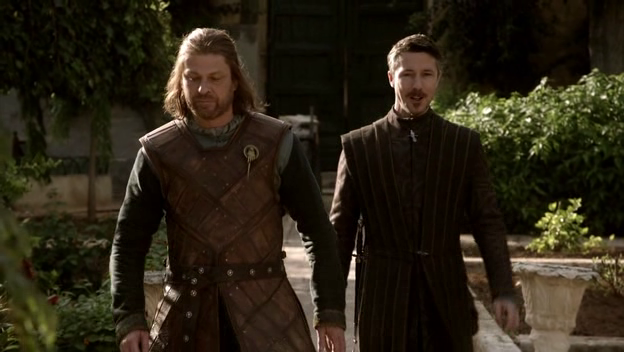 Please note Littlefinger's outfit in this scene: the underlayer appears to be a sort of rough silk, with no pattern. Just keep it in mind until his next appearance. We've never really scene Pycelle in much detail before. I wish we got a better look at all the parts of his chain, but it's clearly way bigger than Luwin's. 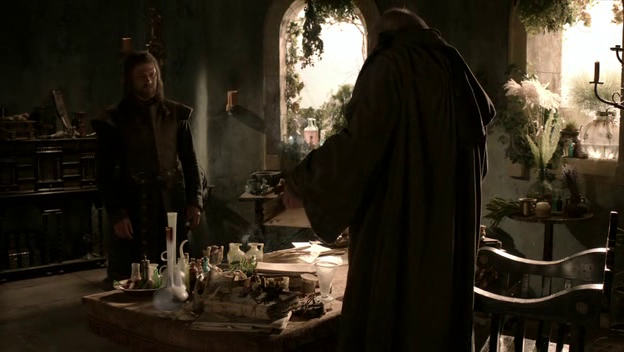 Pycelle may be a supremely irritating character, but his room is one of my favorite sets in the King's Landing, filled with plants, little glass vials, and random steam. It's gorgeous...except for the anatomical drawing of the dissected animal on the way behind Pycelle's desk, which strikes me as rather ominous. It's not clear what animal it is exactly, and I couldn't find any corresponding authentic anatomical diagrams that might shed some light, but it's four-legged with a tail. It's not clearly a direwolf or anything similarly symbolic, but it's close enough to add a touch of darkness and foreboding to a set that is otherwise quite lovely. ....it's another repeat-costume from the last episode. Arya is still practicing swordfighting skills in her trousers, and she discusses possible futures for Bran and herself, first asking if she can be lord of a holdfast, and then flatly rejecting the idea of being a noble lady, a position she is clearly not interested in on any level. ....and it's another Castle Black scene. On top of that, a nearly pitch-black Castle Black scene. This is nearly as much of a costume-bust as Viserys' bath fun time. Sam's neckbeard continues to give me a bit of a kick, though. I suppose, a case could be made for the darkness of the scene being important. This is about Jon and Sam bonding, and here, you can't see the differences between them so much. They're both wrapped in heavy cloaks, both in deep shadow. The reality of the Night's Watch erases a lot of the superficial differences, some might say, though even I think that's a bit of a stretch. 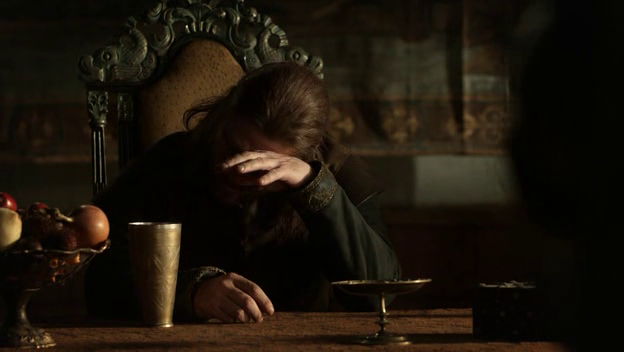 Ned: Lord Baelish, perhaps I was wrong to distrust you. 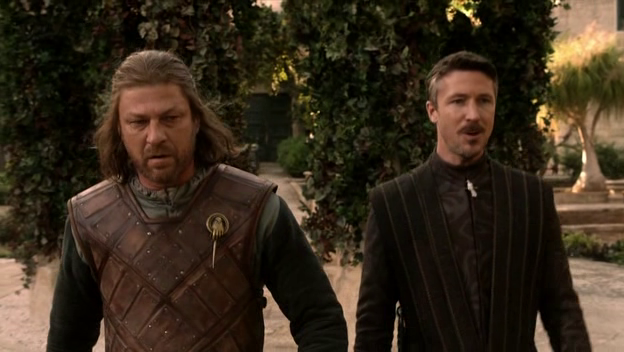 Littlefinger: Distrusting me was the wisest thing you've done since you got off your horse. Littlefinger could not possibly be pushing this point any harder. In a lot of ways, I feel that the costuming in this episode is extremely on-point, so to speak. We had Dothraki-Dany and Viserys's "my people" conversation, trouser-Arya's repudiation of the life planned for her, and now Baelish could only make his character more clear by opening a side-business called Betrayals-R-Us. It's not necessarily a bad thing, but it definitely seems a little less subtle to me than we've seen previously. Any time you have two major characters side-by-side like this, they're practically begging to be compared. 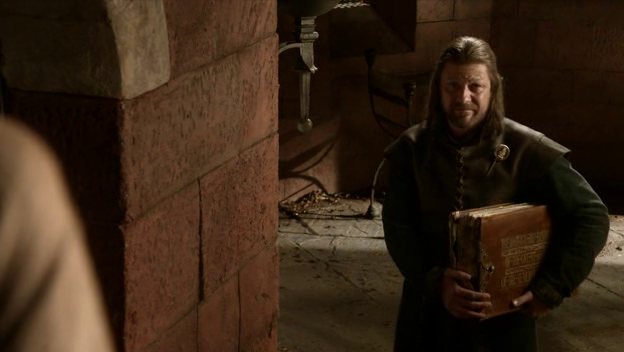 It's notable that Ned wears armor, even inside the Keep. We'll talk more about that later when the dialog specifically addresses what sort of person Ned "is". 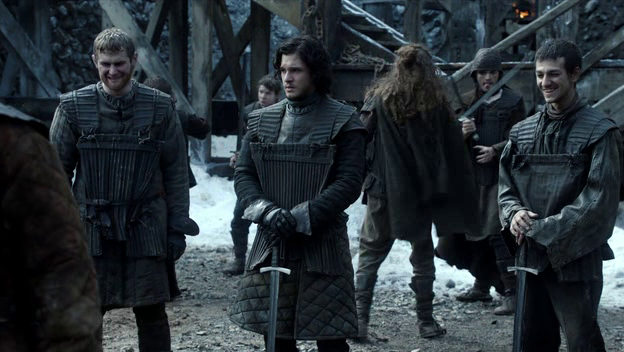 I think it's also kind of neat that Ned's shoulders stick out beyond his armor, while Littlefinger's clothes are designed to make his shoulders look bigger. 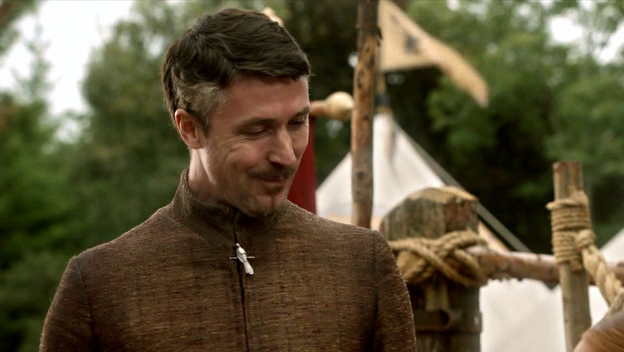 If I had to sum Littlefinger's costume up in a single word, it would be "precision": it's got sharp lines, coordinated colors, a high, buttoned-up collar, and very groomed little goatee and moustache. Ned isn't uncoordinated exactly--color-wise, he is harmoniously northern--but it also doesn't seem like he cares about, say, the seam at his sleeves being so visible, or details like that. 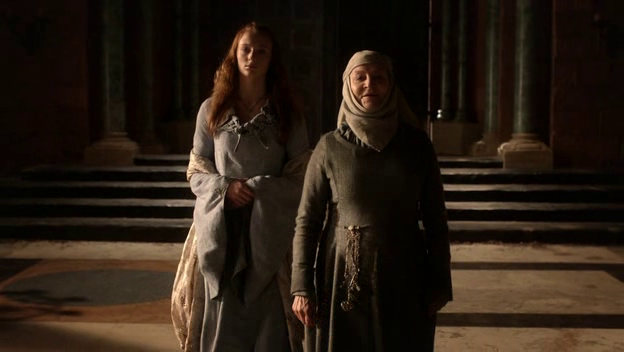 This little shot of a random King's Lady woman and her septa is interesting to me for the contrast it presents with Sansa and Mordane from earlier. I'd sort of assumed that since the Septas are a religious-based group, the grey color Mordane wears was part of their uniform, as it seems to be with the Maesters. This septa here, though, is looking comparatively pretty decked out: two-tone red and yellow to match her lady. She's got the Septa headcovering, but compared to Mordane's, this one is high and stacked, mimicking the stacked hair rolls common in King's Landing. It's not that Septas are inherently plain, it's that Winterfell is interminably unfashionable and pragmatic when compared to the capitol. That's not a character judgment of either place, but it tells you what the priorities are, and what kind of skills you might need to survive in each place. 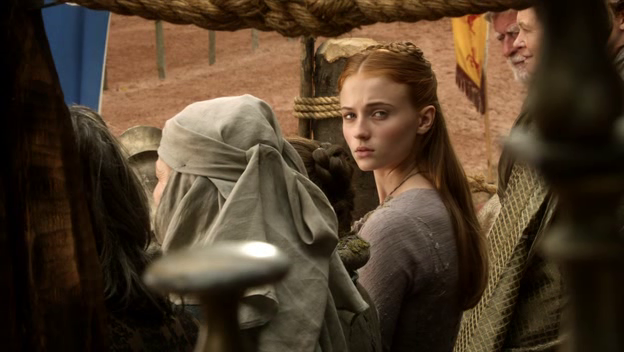 The lady is pretty King's Landing standard-issue: big, piled, braided hair with pigtails over the shoulder, warm colors. The neckline's a little unusual, but this is a total throwaway character. The red-and-gold is perhaps notable, in that they're Lannister colors, and Littlefinger identifies the Septa as being one of his informants. These shots are begging for a compare/contrast treatment too. 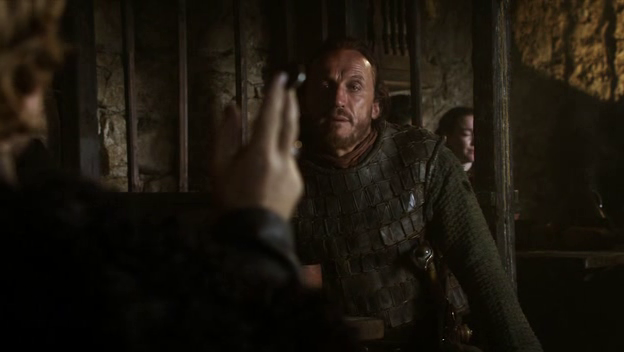 Jory here (who we learned in the last scene is trusted absolutely by Ned) is sent to speak to Ser Hugh of the Vale, recently promoted from squire. Hugh in another pretty minor character (in terms of screen time) so there's not an enormous amount to say about his costume: blue is the Arryn color, the main family in the Vale. It's in comparison with Jory that things start popping out. This episode is very interesting in "knights vs. fighters". Hugh is a "real" knight, but looks slightly foppish with his blond curls and tailored jacket, and is too interested in counting off steps for the joust to talk to a representative from the Hand. Jory is actually wearing armor as a matter of course; he looks dark and functional (and so totally Northern that when I was watching the show for the first time way back when, I had a very tenuous grasp of who he was: the grizzled Nothern men started running together). More talk of knights, and more visual contrasts between types of men. 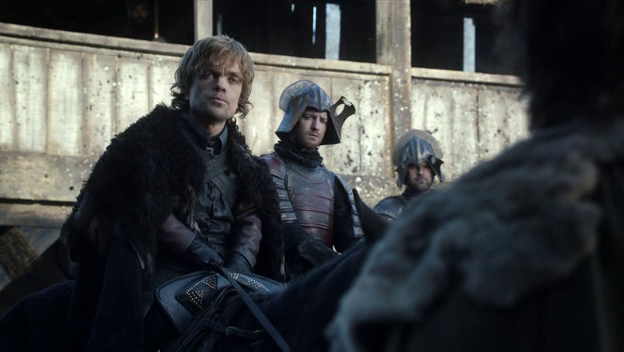 Jory and Ned ride next to each other, and if we were not already familiar with their characters, it would be hard to tell who was the Lord and who the subordinate (I've mentioned in previous posts that Winterfell seems to be a bit more class-blind than other places we've seen). 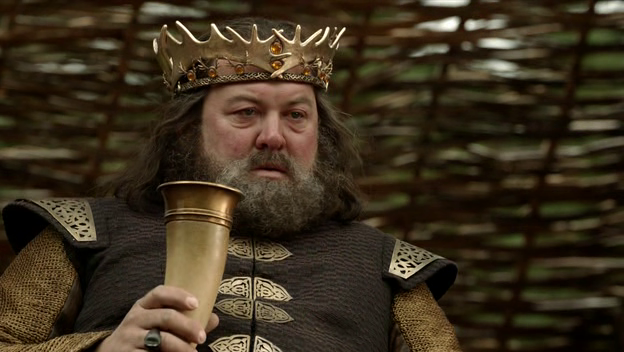 Ned doesn't wear his Hand of the King pin out in the street, it seems. We are shown some truly foppish knights here in the street, with ornate peacock-feather helmets, bright colors, and long capes. 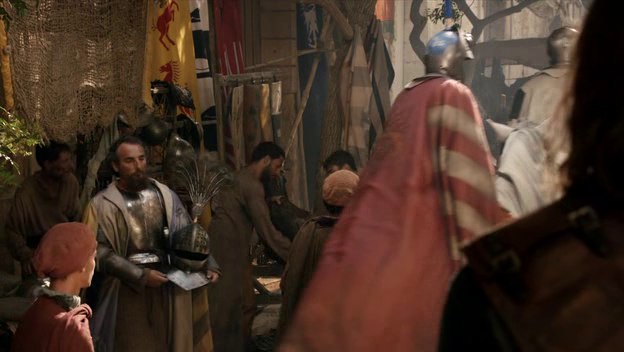 Ned's line over this footage is one of derision for knights who puff themselves up but have never seen a real battle. 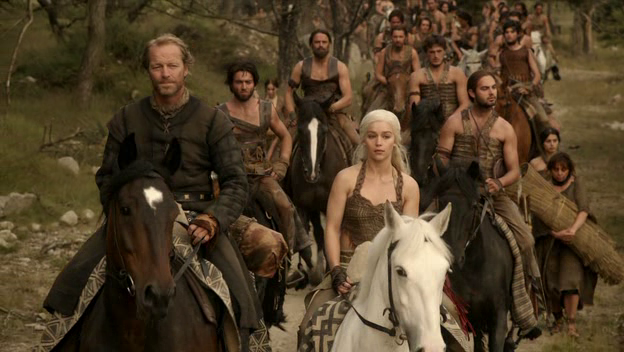 Dany's wedding: the Dothraki look "scarier" and more horde-like than they ever do at any other time. 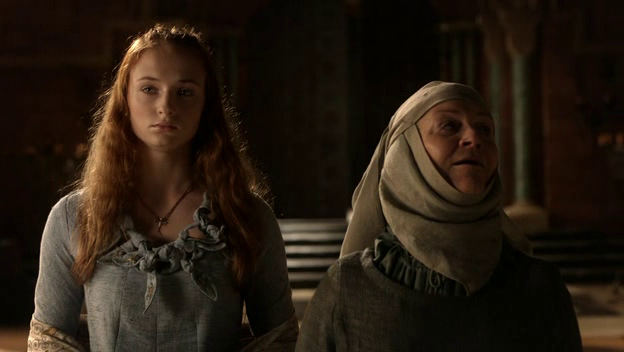 Sansa on the Kingsroad: she watches some of the royal ladies-in-waiting, who are basically bathing in glamor-lighting. Sansa might see them as more perfect than they really are. There are a few other points as well, but those are the ones I recall off the top of my head. I don't know if that's what the directors are doing intentionally, but it would make me happy if they were trying to nod to the original style of the books. I mean, we almost never see knights like in the above shot again (there's one coming in the next episode, but he subverts the whole idea that decorated=useless hard). At the actual tourney, they all look much more subdued (even one known for flamboyance, who we meet in a future episode). This might be how Ned "sees" all the southern knights. 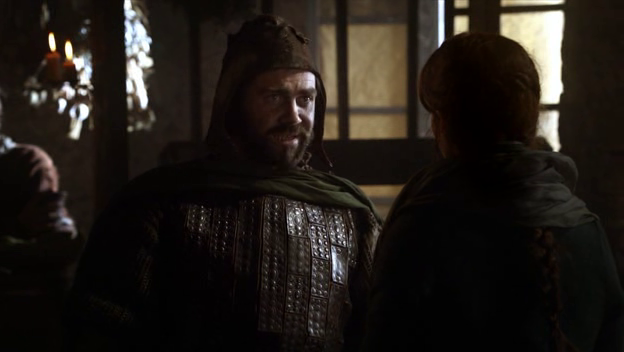 We don't mean many members of the merchant classes in the show, so I thought it was worth taking a brief look at the armorer Ned and Jory meet. The coin-shapes along the edges of his coat are sort of interesting (referencing the fact that he's a townsman, not gentry, perhaps) , as is the singe bit of scale armor on his left arm). 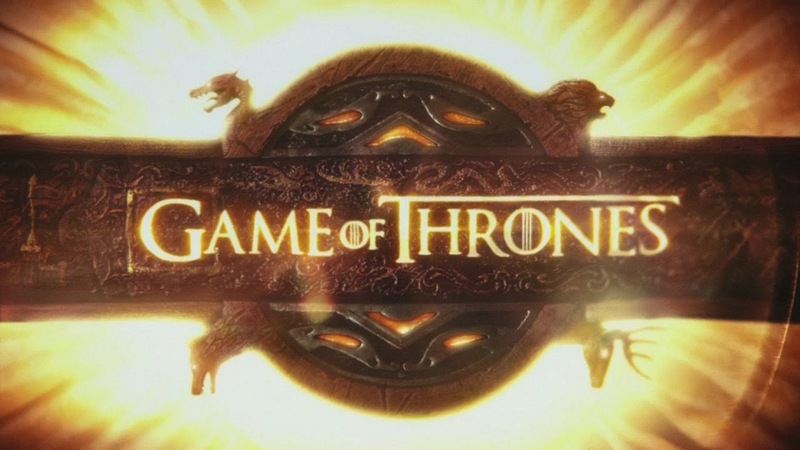 Red and gold again: it's a dominant color scheme throughout King's Landing, possibly made popular by Lannister influence. And just to push the theme a little more, one last overt scene about soldiers. 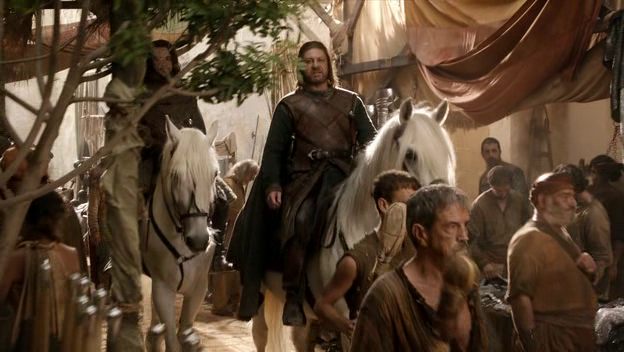 Jaime in full Kingsguard regalia is being made to stand on duty while Robert enjoys some quality time with prostitutes. 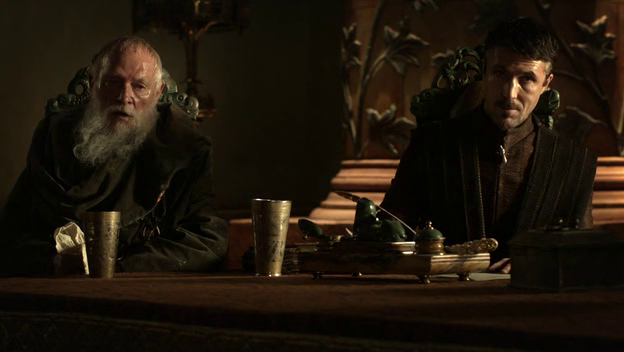 He is snippy with Jory, until Jory mentions that they both fought at the Siege of Pyke (the second bit of Theon/Iron Island backstory this episode) and they seem to briefly bond over the shared memory. A few of the prostitutes run past, and Jory is briefly distracted, and the momentary camaraderie is gone. 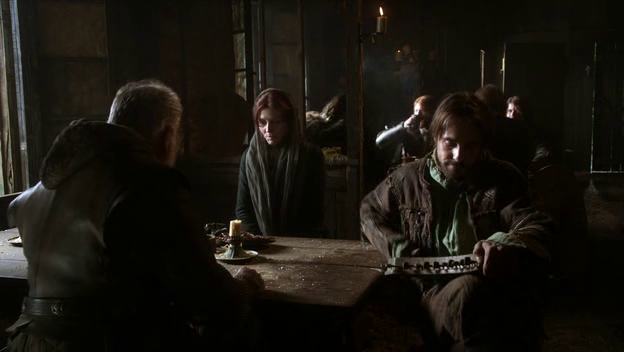 Jaime refuses to take Ned's message saying "he does not serve Lord Stark" and the news is left undelivered. 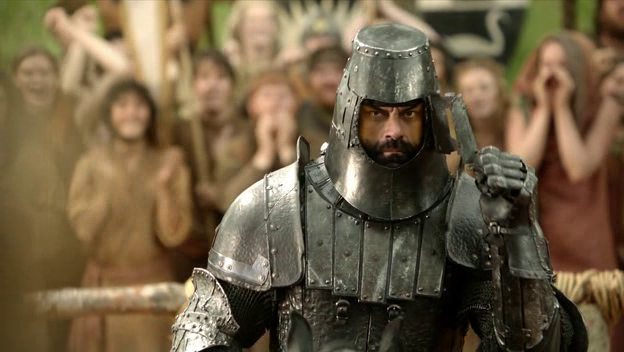 Jaime is a "real fighter" unlike some of the other knights we've met so far, but he comes across as haughty and proud here (as well as insulted on Cersei's behalf). Indeed, everyone who "looks like a knight" in fairy-tale sense is shown to be unhelpful and obstructive. Not a flattering portrayal at all. Aaaaaaaaarghhhhhhhh, more Castle Black, this time with a dark interior! This episode is just refusing to do me any favors whatsoever. But at least costume is an integral part of this scene! 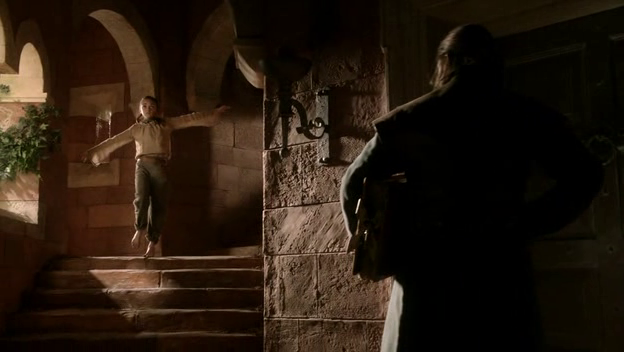 Viserys comes storming in, annoyed at being asked to dinner. 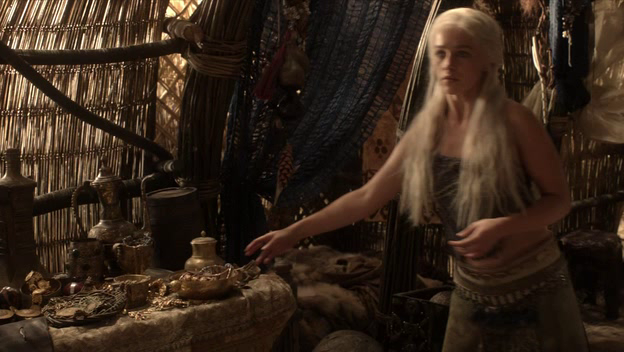 Dany is putting away some jewelry, and we learn that she has a not inconsiderable amount of gold now. She is entirely blended in with her surroundings and her handmaidens. 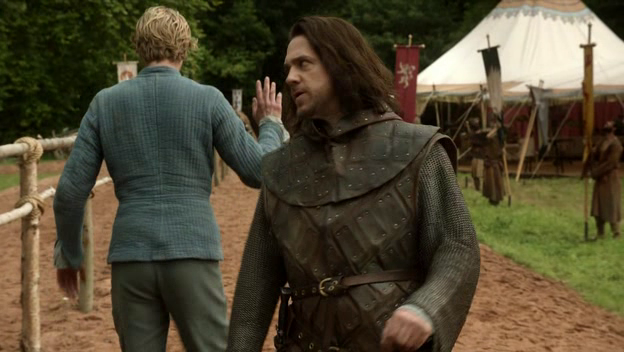 Viserys really does seem to be snapping; his clothes are unwashed and his hair looks straggly and crazy). 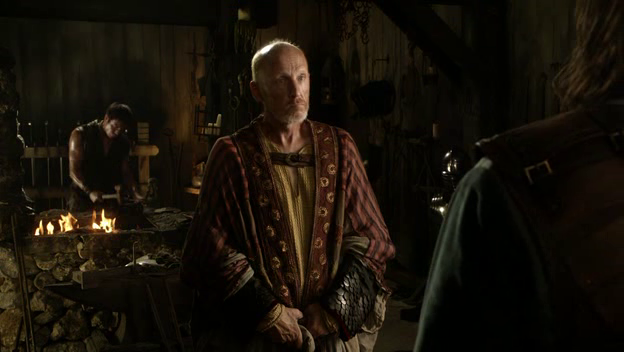 They outright discuss costumes here: Viserys seizes upon a garment that we learn Dany had specially made for him--she is, naively, hoping to integrate her brother into the culture the same way she has herself--and Viserys throws it at her, calling it a rag that stinks of manure. Very tellingly, he goes on to mock Dothraki hair-braiding (hilariously, given that he looks like a spoiled, trust-fund-baby Legolas, in a tone that makes it sound as though he finds it effeminate), and Dany immediately tells him he has no right because he's won no battles and is not a warrior (there's are theme for the episode again). 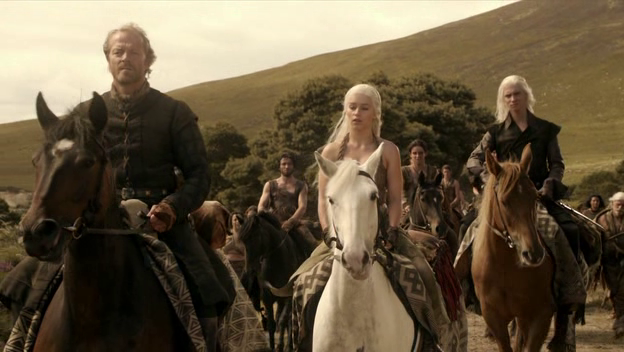 Viserys' general cluelessness is really all on display here, and Dany's Dothraki-zation seems almost total. When she warns Viserys never to hit her again, she does so because of her identity as Khal Drogo's wife, not as a fellow Targaryen and a princess. Her wholes self-conception seems to have really changed. .............................Castle Black. Even more Castle Black. 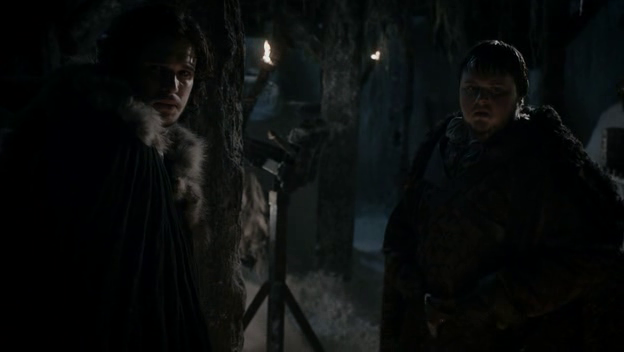 Thematically, this whole scene is right on the nose too: Thorne tells Jon and Sam, "he will call you 'Men of the Night's Watch', but you'd be fools to believe it", along with a story about cannibalism for survival beyond the wall. Real rangers vs. boys pretending. And then we're right back to Dany again, with everyone looking pretty much the same as they were. There is another one of those "same phrase, different meaning" things we've seen before in this episode (eg. "my people"). 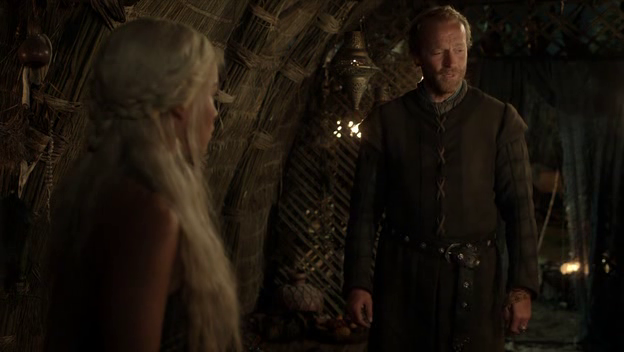 In this case, it's "home", but it's apparent that Dany and Jorah are approaching their longing for a home differently. 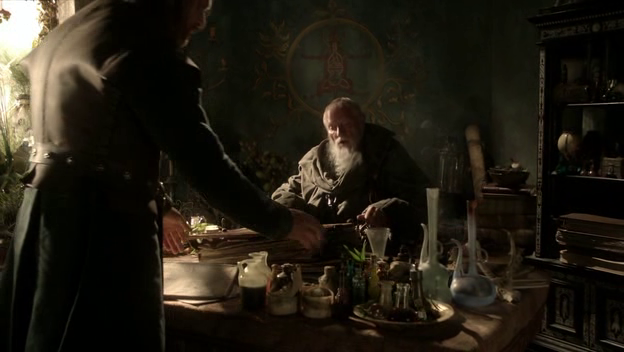 When Jorah says he prays for home, he means Bear Island and Westeros. We don't know how long his been in exile, but he has yet to give up his northern apparel and appearance. Dany means "home" in a more free-floating, abstract sense; perhaps once it means Westeros for her, but the realization that her brother "will never take us home" has made her seek her own among the Dothraki. Tourney of the Hand, Tourney of the Hand! My relief when I saw this, having dutifully screencaped scene after scene of Castle Black and Dany in the same Dothraki Drag, was enormous. We've got some of our costume MVPs all together: Sansa, Cersei, Littlefinger. Let's do this. What a happy-looking royal family, by the way. Don't the just look like the most tight-knit group you ever saw? We'll get to the individuals in turn. 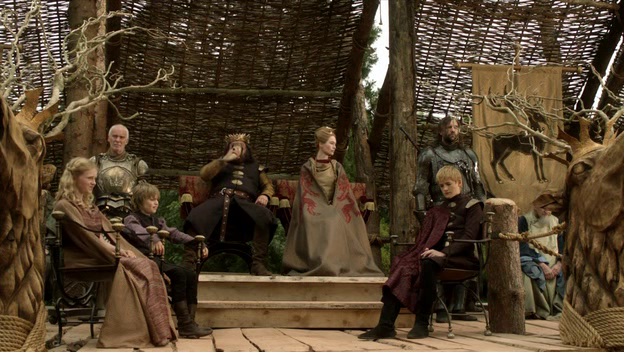 Tommen and Myrcella are kind of glorified extras in this scene, but Tommen's purple is a kind of unusual color. Let's get these two out of the way first, since they're wearing basically the same thing (plus styling), just rendered in different colors. 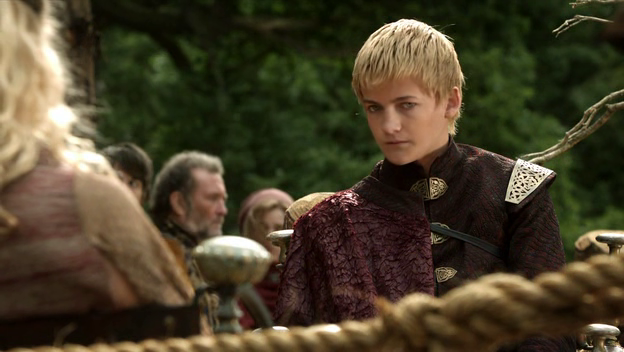 Robert has his Baratheon colors of brown and yellow, and Joffrey is all Lannister red and gold. The show is kind of beating us over the head with the comparison, in light of several of the things we've learned in the course of the episode. 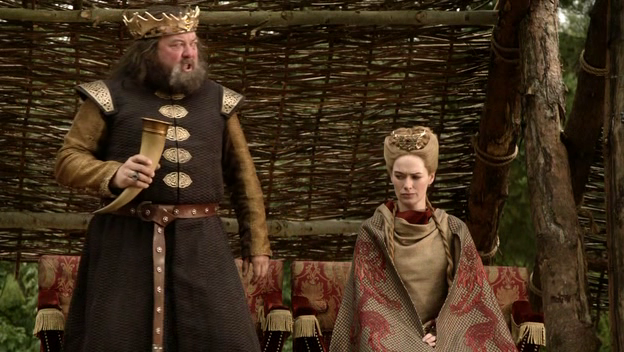 Roberts getting a lot of mileage out of the stag motif in his crown, and Joffrey put a drapy cape on. Cersei, who's gone kind of too far in the opposite direction, and looks pretty nutty here. We very rarely see her with this kind of big, formal hair, perhaps because it looks completely bonkers. The smooth sides and the braids in the center make it look like a basket of snakes. She's got a stag crown too (rare for Cersei to even acknowledge the Baratheon connection) that's holding or trapping a Lannister-red ruby. 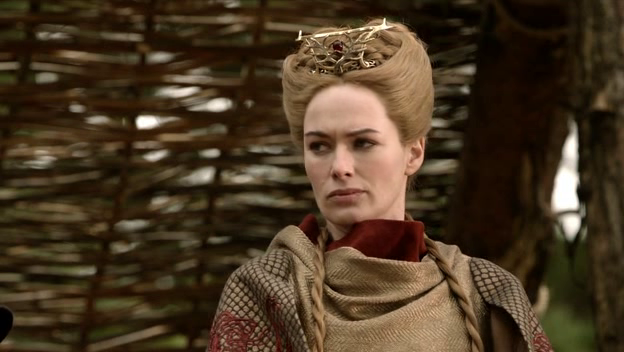 She looks really armored up: big hair, wrapped in prominent Lannister lions, loose, high collar. Let's talk about the second group: Arya, Sansa, and Littlefinger. It is pomaded to the GODS here: any other time we've seen her, it's been actually surprisingly messy and fly-away, but this kind of highly-controlled, smoothed-down hair is going to become a feature of her costume. It may just be me, but Sansa's accent also seems to become rather affected in this particular scene: "Oh gods, who's thaTUH", "And his opponenTUH?" I remember finding it incredibly irritating when I saw the episode for the first time (I have audio-tactile synesthesia, and this over-pronounced, terminal-t sound feels like an ice-cube down the back of my shirt), I'm starting to see it as a natural part of her new look. Still annoying, but understandable. 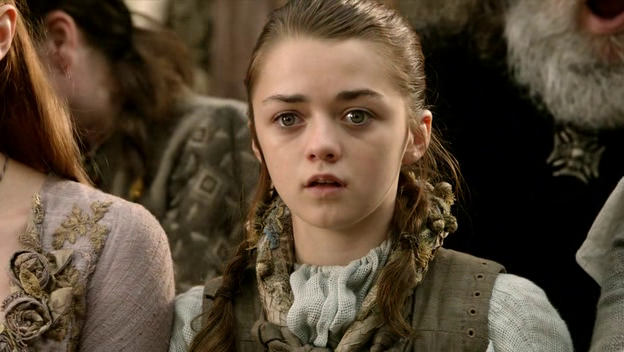 Now, compare her with Arya who's neckline detail looks even more knotted and chaotic than usual. In a sense, Sansa "blooms" in this sort of situation, highly public events where she needs to look good, and Arya is totally out of place. Arya's anti-sleeve stance seems to be continuing too, and importantly, she is wearing the decorated scarf that she wore in Winterfell formal occasions. 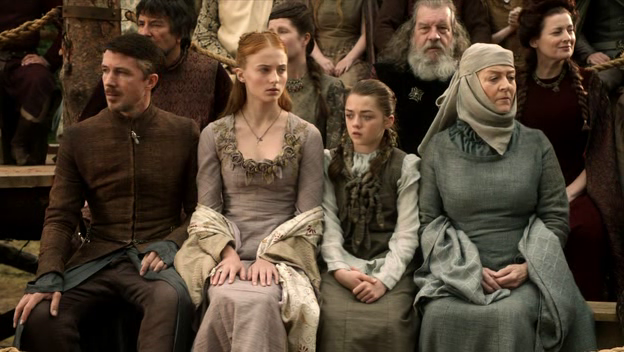 Now, in those Winterfell scenes, Sansa had a similar scarf (so did Cat) but Sansa's clearly abandoned it for a more open-necked southern style; Arya is still wearing hers, along with a very typical northern-style dress (she has the same hair she always does too). The fact that these characters are pulling further and further in opposite directions s very apparent. The Mountain and the Hound. Clearly their goal was to make the Mountain look as big and scary as possible. 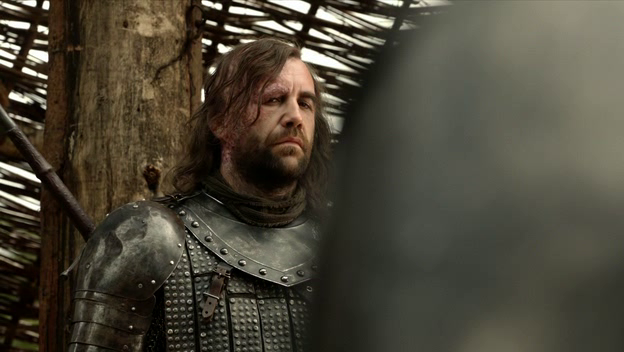 His armor is dimpled and rough-looking (the surface, intriguingly, looks a bit like how they render the burns on Sandor's face, as a bit of linkage between the two brothers). We don't see many flat-top helmets like Gregor's either: it comes across as blunt and unrefined, which is precisely the character. Both brothers are wearing basically the same colors, and neither has their house sigil anywhere prominent (Gregor has it on his shield, but he's hardly dressed in his house colors the way other knights are). Now this is Cersei power-outfit. It's bright red and gold, definitely her official colors: here, she is utterly in control of herself and out to send a message to Ned, who spends the whole scene on the other side of the chair, clutching it like a shield. She starts off as though she wants a fresh to start, "I thought we might put that unpleasantness with the wolves behind us", but ends the scene with a burn, a threat (Ned: I was also trained to kill my enemies. Cersei: As was I. ), and a smug flounce out of the room. We know that the tournament is going on as this conversation is happening, so we also know that Cersei changed out of her crazy, formal outfit and into this one. This is her armor: Lannister colors, with long, loose hair, and some pretty significant cleavage that is yet never really visible (it's always being hidden in the shadows of her outer wrap or her hair). Incidentally, it actually seems like Ned is wearing something new in this scene (the light from the window picks up some unusual detailing on the fabric of his sleeves) but he spends the whole scene pretty shadowed and hard to see. Hopefully we'll get a better look in a later episode. 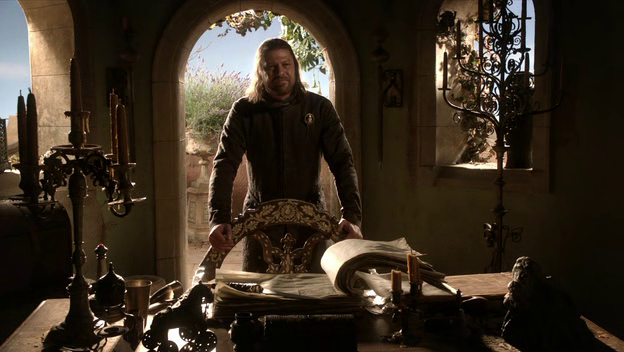 King's Landing is so filled with plant life: look at how much there is, just in that little shot of Ned. Cat and Rodrik are at the inn. I suppose Cat seems like she's gotten mildly better at the whole "traveling incognito" thing. At least she isn't flashing her Tully pin everywhere like she usually is. Tyrion, on the other hand, is all too happy to show off who he is and how much he has. The last time we saw him at Winterfell, he still had his Night's Watch black on, but here, he's back to the gold-embroidered outfit we saw so much of before that. It makes sense, this is a scene about how he's Tyrion Lannister, a member of the family Cat has been warned against by her sister, and that she believes tried to murder Bran. This guy with his funny little cap is identified as a Frey. 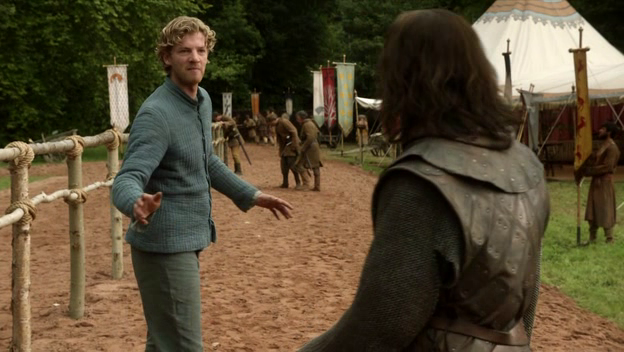 What better way to end a post than with a Frey? I can't think of anything lovelier. 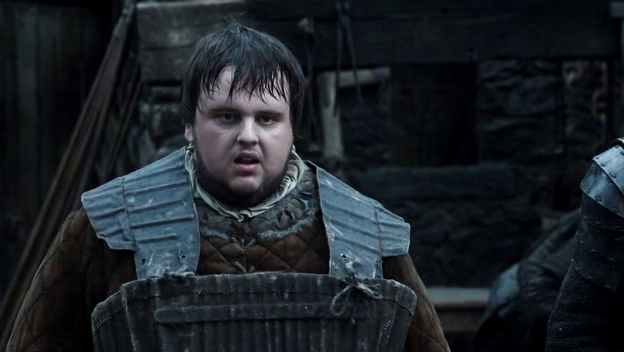 Read the costume analysis for "S1E5: The Wolf and the Lion" here.